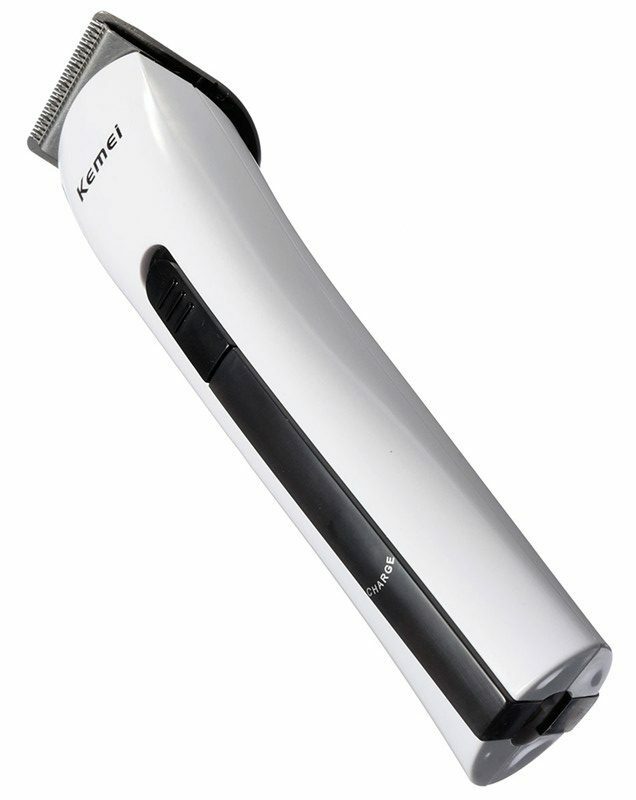 Kemei beard trimmers have a solid reputation for working smoothly and being durable. Here we will explore details about the KM 1008 which many customers look for online. If you want something durable and excellent, you should choose this. It is a popular model from the brand, Kemei and the model number is KM 1008. The cutting lengths vary from 0.6 mm to 6.0 mm. There is a special comb to control 4 settings. The blades are made from hard alloy steel. It can be used as both corded and cordless one. The input is 110/220 Volts. There is a powerful motor which makes it sturdy and robust. The design is ergonomic which makes it suitable for users. The higher the hardness of the blade, the greater will be the resistance to abrasion and friction. It is not going to be like the stainless steel but it will be much more tough and strong. The blades will last a long time and it will trim through hair with ease. It would slide over the facial hair as if there are no obstacles or hurdles on the way. This type of steel is famous for being hard. If there is any problem regarding the beard trimmer, refer to the manual. It is so simple to use that people using devices for their facial hair for the first time can use them with comfort. Many other beard trimmers come with a lot of options, features and complications. Do not take this as a plus point because more options results in more complications. If you have something simple, the work becomes easy and effortless. You can get any look you want with this tool so there is no need of any extra attachments or options. There are many other beard trimmers in the market selling 8, 12 or 21 attachments. They come with a lot of unnecessary parts such as medium comb, scissors, barber comb, 13 guide combs, blade guard etc. If you need to cut your hair, you can use this. It is completely safe for hair on the head. You do not have to go to the barber over and over again. You can save time and money. You have to charge it for 8 hours to make it work for 40 minutes. The design on the beard trimmer is sleek and stylish. It is red and black in color with the switch at the front part. You can use the oil to maintain its blades. 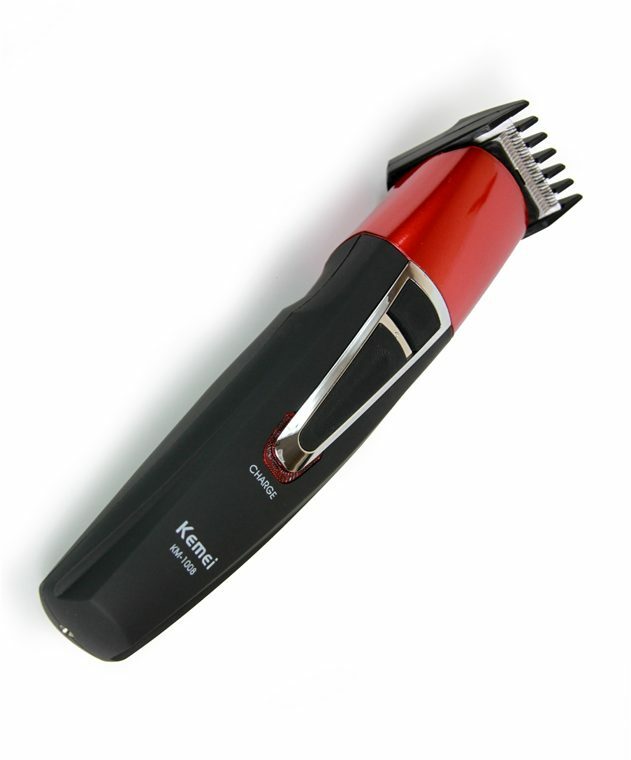 If you want a beard trimmer red in color and you want it to work for more than three hours, you should pick this 518 A. It has a modernized body, smart anti-clip system and push switch for effortless operation. It comes with removable blade for which makes cleaning a piece of cake. Kemei products are designed in such a way that the blade can come of so that you can clean the hair and make it last a long time. If you take care of them, they can last for years. They are incredibly reasonable in price. The blades are made of stainless steel. You can use them on sensitive skin without having to worry about irritation, redness or pain. If you plug it in for 8 hours you can use it for 90 minutes. That is something rare in beard trimmers you find in the market nowadays. Most of them last for40 minutes or one hour. You can adjust the guard according to the length you want to trim. If you do not want to be red, you can pick from more two options which are white and tyrant gold. Since it is made from ABS, it is tough, durable and strong. ABS material is so tough that it is used in materials such as motorcycle helmets and car bumpers. Therefore, you can imagine how sturdy and well-made your device is going to be. If you drop it, it will not break. It is much harder than the other beard trimmers in the market. The lifespan of the device also increases when it is made from this material. It also works on battery so you do not have to worry about charging. You can get any look you want with this. It is suitable for maintain stubble, goatee and any kind of beard. It will go over your face smoothly and get the precise cut that you desire. There is no hassle with this tool and it does not have any unnecessary attachments. It comes with a cleaning brush that you use for maintenance. The beard trimmer has the ability to overcome impacts. Usually products made from ABS material, costs a lot but this is reasonable and low-cost. Users love this and it does not make any extra noise during trimming. It can take care of any kind of facial hair whether it is thick, thin, coarse, dry of rough. You can also this to cut your hair on the head. 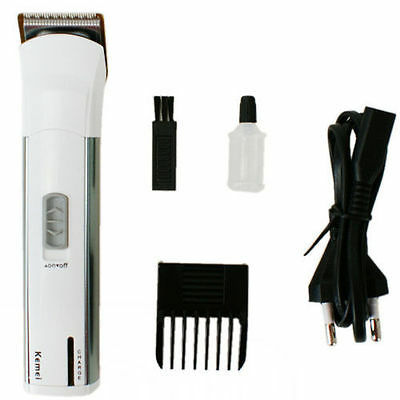 It is not only a beard trimmer but an excellent and long-lasting hair clipper. If you are thinking that Kemei beard trimmers and hair clipper sets cost less because they do not come with enough or extra attachments and accessories, you will have to think differently. Many users prefer a simple and easy trimming so they prefer beard trimmers that does not come with too much items such as 5 guard combs, 1 scissors, 5 changeable heads etc. That is why Kemei lets the customers have a hassle-free experience. They are also suitable for beginners because they do not have any complications in them. Although, if this is your demand or complain “I want many attachments to look stylish” then this 3007 is the perfect model for you. 1. 3 in 1 grooming tool so you do not have to buy anything else for maintain facial hair. The user can utilize it for trimming beard, clipping hair on the head and styling, fixing and detailing. 2. Comes with a modern and innovative smart ergonomic design. 6. The chief switch can govern the action of the rechargeable beard trimmer and hair clipper. 8. Changing stand or base is there for supporting the whole apparatus during charging. It comes with a bottle of oil and you can use to maintain it. If you can take care of the tool, it will last for years. 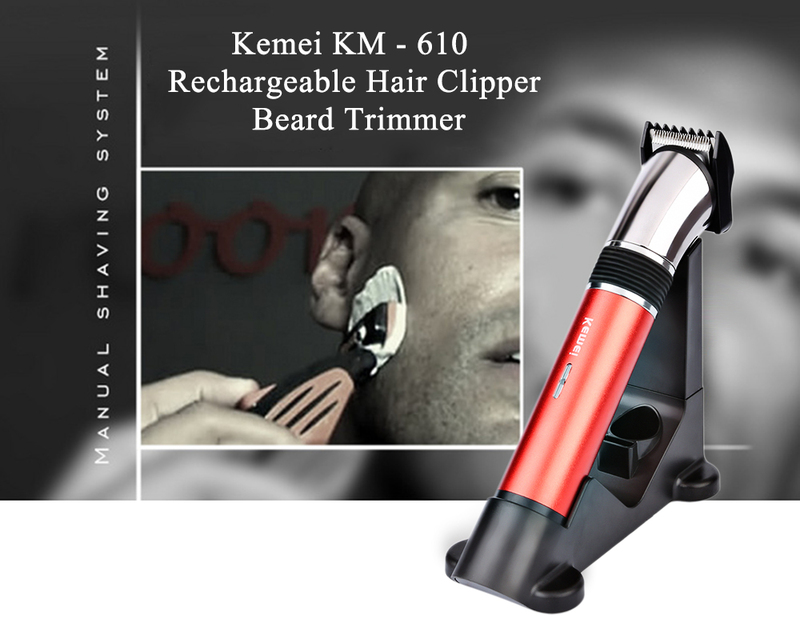 Kemei’s beard trimmers are tough, solid and durable and this one is no different. It comes with a lot of attachments so you have to take care of those. You can use them to get the best of facial hair. You can carry out various facial hair styles on yourself. You can get the stubble look which is an attractive style for men nowadays. You can also maintain a long beard. The beard trimmer can make you look like a stylish, confident and brave person who is also ambitious. You have to charge it for 8 hours to make it work for 80 minutes. That is quite a long operation time and the trimming session will be noiseless. 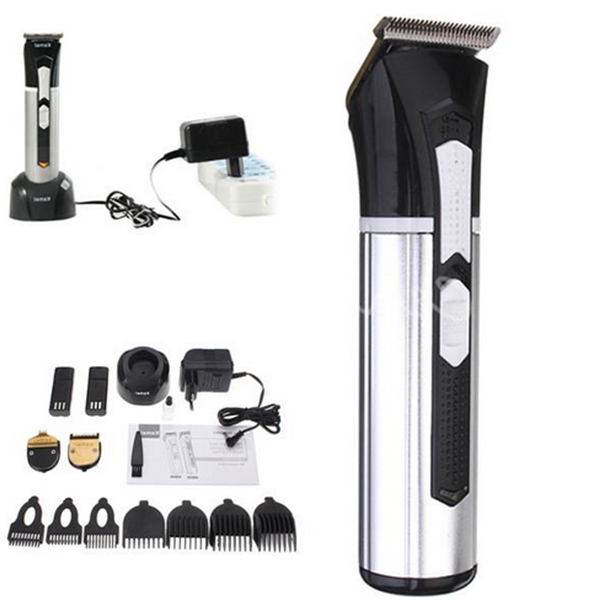 If you are in need of a beard trimmer that is reasonable in price but does the job of grooming facial hair very well, you should go for the KM 2599. Users love it because it works far better than they expected and it is tough and solid. Choosing a beard trimmer can be difficult but if you know what you want, this should be easy. It is suitable for a stubble look. If you want to maintain a five o’clock shadow, this should be your selection. The stubble look is one of the most attractive styles for men of various ages. To get that look and maintain it, you will need this device. It is a beard trimmer which also serves as a hair clipper. It comes with an ergonomic design and a strong motor. The battery is powerful and the input is 220 V. It comes it two colors: black and white. Before ordering online or buying from a store, make sure you pick out the color you like best. There are precision cutting blades and variable in cutting length allows the user to get the style they want. They get any look they want using this device. The blades are made from stainless steel. It is well-built and comes with a friendly interface. As you can tell by know that it is perfect for sensitive skin, the reason is because of the stainless-steel blades. The manufactures picked this material for making the blades because it has the hypo-allergenic feature. The blades will not cause any razor burn, irritation, discomfort or redness. Some beard trimmer blades are made from nickel which can cause irritation in the skin. The product guarantee that the user will not feel any sort of pain. They are also sharp, durable and sturdy. It is rechargeable and cordless. If you use it for an hour, you will have to plug it in for eight hours. If you forget to take the plug off and mistakenly it becomes ten hours of charging, that should not be a problem. If you want a stubble look, the trimmer can get you that. Since it is light, you can take it during travel. There is not much attachments, so you will not have to worry about them. If you do not have ten hours of time, plug it in for an hour to make it work for some time.